New friends, old faces, poisonous mushrooms and octopus submarines. So I've now finished book eleven, only two more to go in the series, not sure if I'm excited or sad to see it end. Anyway back to the topic at hand, Book eleven well we left of in book ten with the Baudelaire's having lost Quigley overboard and the three orphans being stuck drifting down the stricken stream at a great rate of knots with no idea how they were going to survive. We pick them back up in book eleven still in the stricken stream desperately trying to figure out a way to survive. When suddenly a periscope appears out of the water and the children realise its from a submarine. With no other options the children climb on board and hope the sub is a friend and not a foe. Once on board the Baudelaire's meet Captain Widdershins, his stepdaughter Fiona and once again they run into Phil whom they met at the Lucky Smells Lumber mill. Happy that the submarine seems a safe place to be the Baudelaire's catch up on whats been going on and soon find out that the crew of the submarine have been searching for the Baudelaire's and they now have a mission to find the mysterious sugar bowl. So without hesitation they set about trying to figure out where it could be. Klaus discovers the location of where the sugar bowl should be and they set a course and are soon on there way to the Gorgonian Grotto. Little do they know that once they enter the Gorgonian Grotto all there trouble will begin again, from poisonous mushrooms, to Captain Widdershins and Phil going missing and of course to Count Olaf being right behind them. Can they find a cure for the mushrooms? Can they escape Olaf again? Will they get to V.F.D in time? 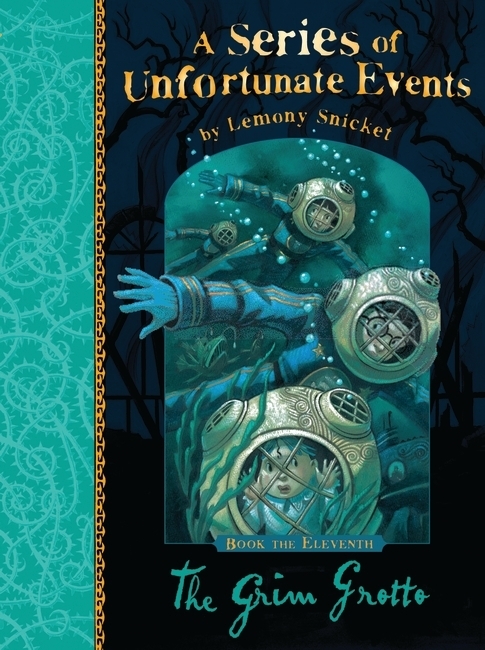 I enjoyed this book, which I'm glad about as i said i only gave the previous book 4*, I really enjoyed this one although i did find it annoying how Snicket kept referring to the water cycle. I'm used to him trying to persuade you to read a different book and i think this is another one of Snicket's quirky writing techniques however, there is nothing more boring than the water cycle process which well he does tell you that when saying you would be better off being bored for hours reading up on the water cycle then reading the tragic and unfortunate tale of the three Baudelaire's. Again i was hoping we would find out what has happened to the Quagmire's but nothing was mentioned of them. I do hope we find out what happens to them before the series finishes.